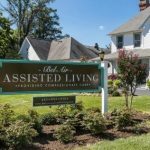 Bel Air Assisted Living is a luxury assisted living facility located in beautiful Harford County, Maryland. Privately owned and operated, we offer the highest staff-to-resident ratio in Greater Baltimore with just 1 caregiver for every 5 residents. Unlike large corporate facilities, Bel Air Assisted Living offers private suites, home-cooked meals by a personal chef, family visits 24 hours a day, and one-on-one attention. Our mission is to take care of your family like it’s our family.